I’m loving the craftwork mashaAllah! It’s something I really miss here, i haven’t got any supplies yet. Regarding the sashiko, do you draw a pattern onto the carbon paper then trace it onto the fabric? (Forgive me if this is so obvious, lol!) Also are there any traditional patterns, or do you just make up your own? I’m going to have to convince my husband that crafty stuff is an absolute essential as I am raring to go! Traditional sashiko is done on indigo cloth and uses a special sashiko thread (I believe it is a little thicker than our usual embroidery flosses). Stitchers can get kits and samplers with the patterns already drawn on or they can transfer the patterns onto the fabric themselves. 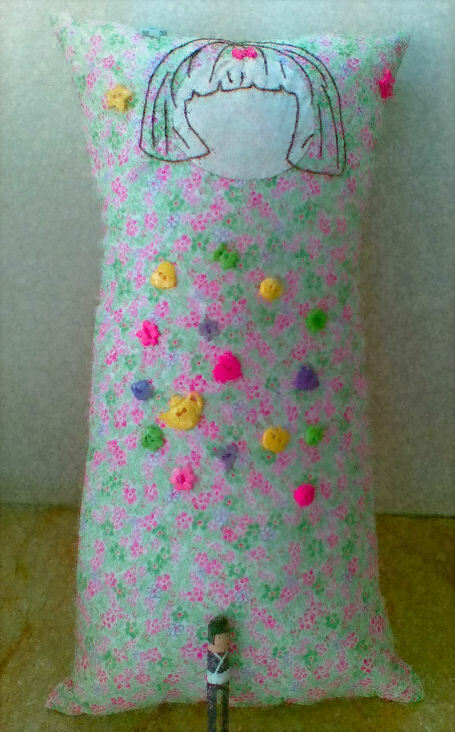 There are traditional patterns but if you are good at drawing, then you can make your own patterns. I’m terrible at drawing LOL and I found the kits pretty expensive so I found some patterns that I printed out. I will put them up in my next post so you and Umm Maimoonah can download OK? I used my stash of plain cream calico and also a locally produced fabric here called karandi (it looks like linen but is not as stifff). I’ve run out of transfer paper (this is best as it washes out from the fabric easily once your embroidery is done) AND I’ve run out transfer marker pens (the ink washes out nicely too). So what I did was to just get some blue carbon paper from the stationery store – embroidery purists must be cringing but hey, you make do with what you have right? (1) If the fabric needs to be shrunk, soak it and then let dry. Cut out the fabric to required size, leaving a good-sized allowance for a border so that the final product can be framed or stitched onto something else. Press the fabric till it is smooth and stiff. (2) Place the fabric onto a hard surface/table. Then, put the carbon paper onto the fabric, carbon side onto the fabric. (3) Position the pattern onto the carbon paper. Now’s a good time to tell your kids to STAY AWAY. I go ape if they jostle my arm and the drawn pattern goes all askew! The best thing to do is to tape or pin the 3 layers of fabric, carbon paper and pattern together if it is a large and complex pattern. This way nothing gets misaligned. If you have a transfer marker pen, then you don’t have to use transfer paper. Tape the pattern onto your window when it is bright. Place the fabric over the pattern. 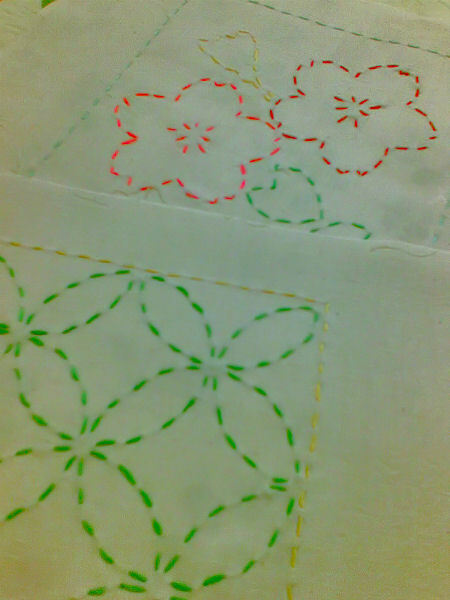 If the fabric is light, you can see the pattern and you can just draw the pattern directly onto the paper. I just love these masha Allaah!. Now you gave me an idea. I really do not know what this sashiko is all about, sorry for being dumb, : ) but I like the look of the patterns and the stitching which is tempting me to try. So how do I get these patterns? Oh that Choti looks beautiful too, well done! Jazzakillaah Khayr for sharing all this! 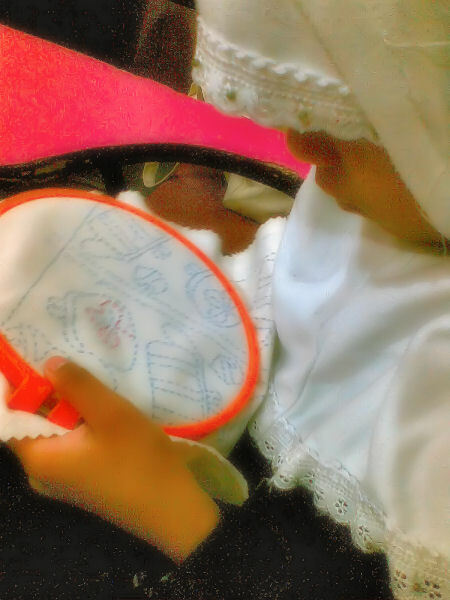 Awwww… jazakillah khayran for your nice words Umm Maimoonah :) Sashiko embroidery uses the running stitch to make a picture. There are some rules to it (I will post a link to these in my next post in shaa Allah) but it can be really easy and relaxing. There are more complex patterns – I chose the simpler ones to start out with. In shaa Allah I will post the patterns I have in my stash in my next post OK? MashaAllah, i love the Choti! Jazakillah khayran :) Alhamdulillah that I had JUST enough stuffing! It was touch and go for a while there!